Hindsight being what it is, I don’t imagine that I should have ever thought that a movie starring people named Rik Von Nutter and Gaby Farinon would be anything above “worst movie about a runaway space station ever” status. If Rik and Gaby never had the good sense to change their names to something that didn’t immediately make me think that this was some type of send up of movies about runaway space stations, then why would I think they had any ability to judge scripts? Still, when I saw that the director was the American-sounding Anthony Dawson, I thought that maybe this might be a hidden gem since I knew that that American-sounding name was really hiding the Italian-sounding name of Antonio Margheriti. Over his forty-plus years career, Margheriti managed to make movies in every Italian film genre imaginable. Gothic horror, sword and sandal, giallo, war, cannibals, killer fish, spaghetti western, and space opera are all represented in his oeuvre. And he was a guy who only seemed to get better as he went along. While 1964’s Castle of Blood was a stolid movie that could’ve have turned a hyperactive four-year-old pumped full of Twinkies and Jolt into Rip Van Winkle, Cannibal Apocalypse has to be acknowledged as the premiere “crazed Vietnam vet cannibal” movie of its era. Even movies with questionable premises such as the Indiana Jones inspired The Ark of the Sun God which featured a Trans Am chase and really hideous model work more than justified its importation from Italy with all its laughable action. All of this is a prelude to trying to explain just how horrible Assignment: Outer Space truly is. No, it isn’t so horrible that it’s hilarious. 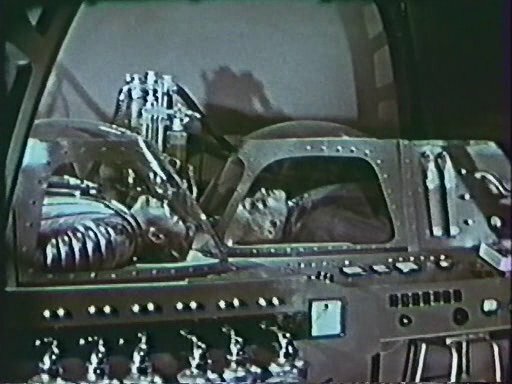 Yes, the special effects depicting all the outer space action are so embarrassing you wonder how they could have ever had the courage to put them on screen, but how often can you look at unmoving astronauts “floating” against a backdrop of stars that for some reason are blinking like those little cheap white Christmas lights before moving from amused to bored? Abominable special effects don’t automatically raise my ire though. Antonio’s special effects several decades later in The Ark of the Sun God weren’t appreciably any better and I managed to laugh with them instead of turn my nose up at them. But that was because they served a story that wasn’t a mundane, confusing talkfest like what we endured with Assignment: Outer Space. If you’re going to have your generic characters sitting around the same cramped cockpit jabber jawing all day about a space station and the photonic field it’s emitting that is threatening to melt the Earth, put a little effort into making it look nice. Nothing was ever terribly clear as far as who was who or what was happening here other than then the fact that we were in the far-flung 22nd century where the astronauts wore suits that looked like silver Michelin Man costumes and had helmets that looked to be good-sized televisions turned on their side. 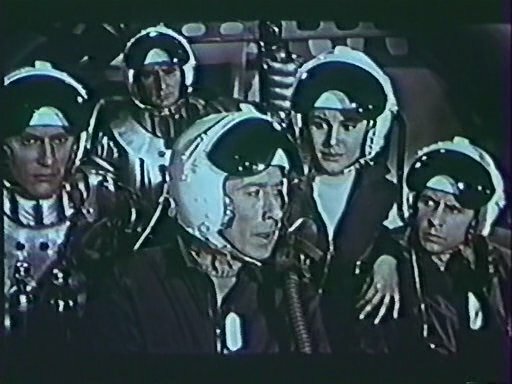 Ray is the reporter accompanying the crew of a space ship headed by an uptight captain (prunefaced expressions are the response to every crisis). Ray also narrates the action for us, but in what would have to be called an odd artistic decision, different actors dub Ray’s speaking voice and his narration. Sometimes I forgot that the narrator was also Ray. But then again sometimes I forgot to stay awake, so maybe it was explained while I dozed, like Ray had a cold or something. Lucy is the token female/love interest and I think that Captain George was sweet on her, but the dashing and multiple-voiced Ray captures her heart thus causing some tension between George and Ray that culminates in a zero gravity punch that looks like a slow motion sissy move more than anything else. Al is the stud pilot with bleached white hair who’s been around forever and done it all. Every so often he’d chip in some awful bit of philosophy that would’ve have easily been the worst dialogue of the film, but for Captain George’s soulful rumination about how outer space has been explored more thoroughly than human emotions. That’s some pretty scary talk coming from the captain of your ship, especially since he’s resigned himself to the fact that there’s no way to stop the runaway space station. But guess who’s not going down without a fight? Guess who’s going to get the scoop of the 22nd century or die trying? Guess who just hopped in the space taxi and flew off to the space station to destroy it? 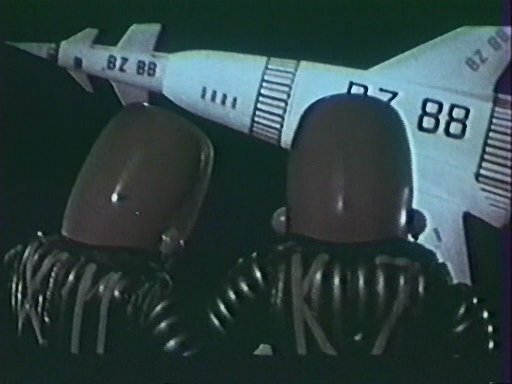 I’ll confess that this movie lost whatever chance it may have had with me as soon as I heard folks going on and on about a space taxi. Say what you want about the Star Trek franchise, but do you really think anyone would remember it today if the crew took space taxis down to a planet’s surface instead of shuttle craft? And the space taxi is just some open-air vehicle that drives around space like a little motor boat or something! 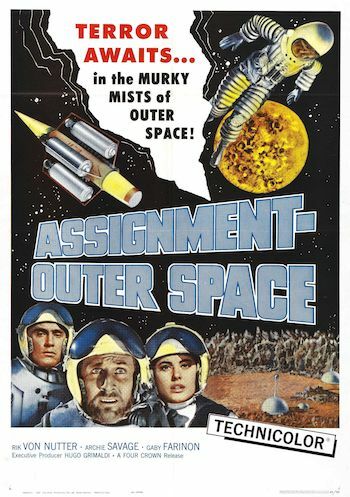 Technically deficient on every level, devoid of talent at every turn, the most shocking aspect of Assignment: Outer Space is that being Margheriti’s second directorial effort, he ever had a third one.